That’s right, it flew apart while driving. My wife and I were cruising down the road about 40 mph when what sounded like my rear end or a bomb exploded! No jerking, no nothing. Just a hell of a lot of noise. Then I noticed I had no acceleration. Hit the pedal and it was like it was in neutral. We came to a stop and I found belt fragments around the skid plates. It’s a 2017 year model, has 890 miles and 250 hours on it. It does not get abused at all, but I do work it. If that makes any sense. I do take it up to top speed occasionally. I have 30”x7-3/4” tires as well. All that said to ask this. Is this normal wear out time for the belt? Do you think the tall tires caused a premature failure? Is the Gates name brand belt better than Deere OEM belt? Gates G Force belt ordered and due to come in tomorrow. You'll have to post back how long this belt lasts. I'd be a bit disappointed if that is all the longer the next belt lasts. Good luck and hopefully you'll get 500 hours on this belt. One thing that strikes me is your tire diameter of 30" which is significantly larger than the 27" stock stuff. That means more inertia to overcome on acceleration, engine and clutch work harder, you name it. If it was a stock JD belt, I'm not surprised. You'll appreciate the Gates solution. I turboed my 855D and found laying in the extra torque all the time takes its toll on a belt as well. That's why I use the Gates. Solid year on it and it still looks virtually great. One of the biggest culprits with belt failure is heat. For example, excessive heat can be generated by slipping the belt when starting out on a incline in high range or when stopped leaving the Gator in gear while opening a gate. This condition is also referred to as “glazing” or “smoking a belt”. Additionally using a”belt dressing” on the CVT belt, will cause excessive slipping on the clutch’s. Another possibility is the clutch air intake is blocked by an obstruction such as a inadvertently leaving a shop rag in the intake tube. I’m not saying this is the case, however this could happen to someone. 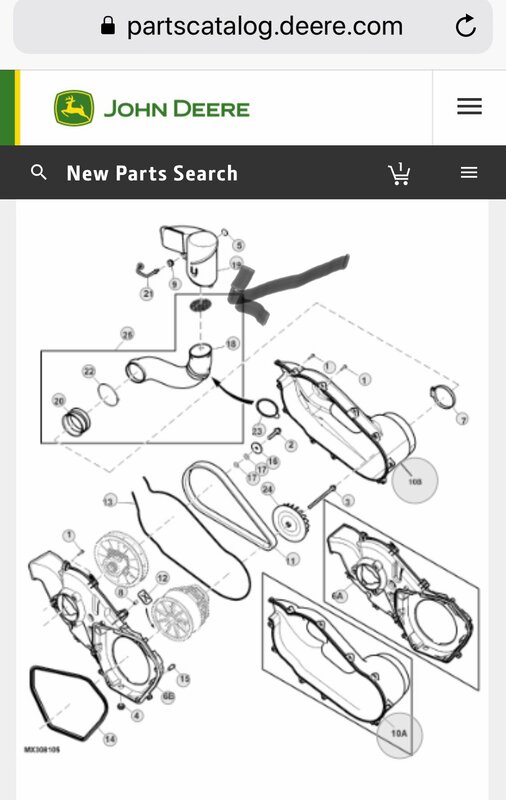 Also clean the filter between the air box and intake tube- see below. This filter can become caked with dust, debris and even rodent nests. Finally when installing a new belt make sure you clean the belt with hot soapy water AND follow belt break-in procedures as defined in the document below. New CVT drive belts require a break-in period of at minimum 30 Miles to maximize belt life and performance. The goal of the break-in period is to properly wear in the belt to match the sheaves before applying maximum engine torque. By conservatively running through the entire shift range, proper belt contact over the entire sheave/belt contact path is optimized to eliminate belt slippage and drastically increase the belt’s lifespan. •Vary vehicle speed and engine RPM to shift belt through normal operational range. •Do not exceed ¾ throttle within the first 30 miles of installation. •Stop engine and allow belt to cool down every 15 minutes of use. •Aggressive Acceleration or ‘Jerky’ throttle movements at low speeds. •Holding engine/vehicle speed constant for extended time periods. •Long run times without complete CVT/belt cool down. By following the break-in process carefully, the belt surface will wear in to match the individual CVT sheaves to maximize grip performance and dramatically reduce heat, glazing, and future wear. Last edited by Bradhill; 04-17-2019 at 09:53 AM. It was the stock belt. I was worried that the bigger tires played a significant part in this whole deal. I’ve read some reviews on the Gates belts. Even on other more powerful bikes, folks seemed to like them a lot. I also use Gates hoses and their other rubber products in the oil industry. They are far superior products in those uses as well. Wow, this post helped and answered so many things! Thank you Brad for all the time and research spent putting this together. So after reading this and putting the new belt on this evening, I am totally at fault on killing the stock belt so soon. The screen on the intake tube (that I didn’t even knew existed) was plugged with leaves. It’s sat on idle while in gear more hours than I’d like to share. Almost always pulled a trailer in high gear. In fact, I rarely used low gear. The big tires. They are not on there for mud riding, but I do go in a good bit of mud. It’s a farm machine, I’m in south Louisiana. We have more mud than dry dirt around here. I did none of the belt break in things listed when the machine was new. I also found out that the “jumping” I was getting when it would start to take off was a sign that the belt was bad. It’s been doing this a long time. I just figured it needed more pedal to start off with the big tires. It’s been giving me this warning sign for a long time. Long enough that I forgot how it’s supposed to take off. @Granger more than happy to help! I’m pleased you found some value, with the information provided. Please keep us all updated! !